The first trailer for the MCU's wild card is here - but does it size up to the competition? Marvel's recent trailers for their Cinematic Universe releases have been pretty great. The haunting "No Strings On Me" of Avengers: Age Of Ultron sent chills down our spine. The wacky space antics of Guardians Of The Galaxy set to "Hooked On A Feeling" got us excited for a story with characters that previously, most of us weren't even that familiar with. Yep, it seems as though the MCU is coming into its own, in terms of embracing and just having fun with the fantastic, oft-camp ridiculousness of the superhero world it has created. The first trailer for Marvel's long-awaited and developmentally-challenged project debuted on US television last night, along with the first episode of Agent Carter, before premiering online this morning. And, honestly, it seems a little stiff. There's no denying Ant-Man is one of the silliest superheroes that comics can offer: Hank Pym is a genius scientist that develops a suit capable of shrinking someone down to the size of an ant, wherein he rides other ants, messes around with atoms, and gets the jump on bad guys. But other than a quip from Paul Rudd's character Scott "Other Ant-Man" Lang about the name, the first trailer seems to, well, shoot oddly straight. And it's setting off alarm bells in Marvel fans' heads, that maybe this MCU offering might be trying to take itself too seriously. Throughout production, the movie has been under heavy scrutiny, after Director Peyton Reed stepped in to replace fan-favourite Edgar Wright. And the unnecessarily negative feedback might just be clouding everyone's ant-sized expectations for this movie. I mean, in spite of the serious tone, it looks cool. And the seemingly more personal stakes of Ant-Man are a nice deviation; the trailer indicates Scott Lang's origin story is one of redemption, something that could be a nice break from the epic-galaxy-wrecking consequences that the rest of the MCU offers. But if epic-galaxy-wrecking is more of your thing, then don't worry - Age Of Ultron is only a few months away. 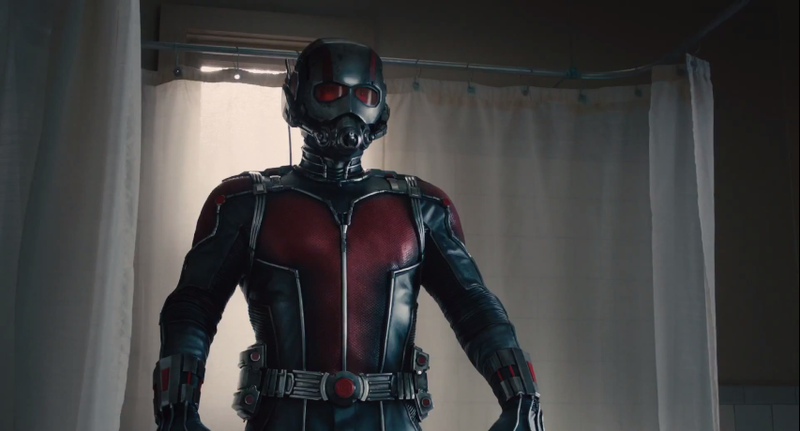 Meanhile, check out the first Ant-Man trailer below.